Machine Embroidery Projects » Embroidery Talk Has Moved! I spend a lot of time on the Internet. I also, since I work for a machine embroidery supplies company, spend a lot of time researching various issues related to machine embroidery. Lately I’ve spent a lot of time looking at available design sets and seeing what else is out there in the way of machine embroidery projects. Today I thought I would share a bit of what I’ve found with our readers. Perfect Little Stitches has a great array of free machine embroidery projects. Any or all of these projects would look great when embroidered with Iris thread. I especially like the embroidered umbrella and the embroidered bug hat (so useful in Michigan’s Upper Peninsula this time of year). Embroidery Treasures, which is a great blog by the way, has some terrific free projects available. The baked potato bag is cute, as are the dishwasher hangers. Secrets of Embroidery has an extensive list of machine embroidery projects. Just going through them all could take hours. You could wear out a lot of needles if you tried to create all these projects in one go. 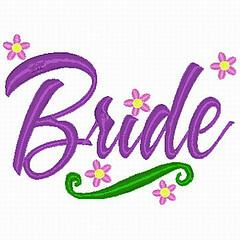 You can also find some great free embroidery designs at Embroidery Designs.com. They have some cute stuff. If you’re looking for machine embroidery designs for a new baby, Needle Passion Embroidery has a great set of baby themed designs. These would look great when embroidered with EnMart’s Baby Gift thread palette. Whatever the project or design that you decide to embroider, I wanted to remind everyone that EnMart has always the supplies you need to make your stitch outs shine. We also love to see what our customers create with our products, so if you’ve done something you especially like, please share a photo with us. This entry was posted on Wednesday, June 17th, 2009 at 12:13 pm and is filed under Garment Decoration. You can follow any responses to this entry through the RSS 2.0 feed. Both comments and pings are currently closed.